Paul Molitor is nearing the end of his fourth season as the Minnesota Twins manager. During his first season, the Twins pushed for a playoff spot into the season’s last weeks. There were over 100 losses in 2016. He won AL Manager of the year in 2017 after the Twins bounced back to earn a Wild Card spot. Now in his fourth season, the club is sitting below the .500 mark. I think he's doing fine. A manager's role in wins and losses is vastly overstated (wins or losses). As for the lineup, I'd say he does just fine. He mixes it up pretty well and isn't married to certain hitters in certain spots. Bullpen usage is where most find fault. I definitely think he has a tendency to overwork the reliable relievers which, practically, is understandable. But he will need to find a way to trust others to try to keep those top guys from wearing down. He's obviously well respected in the clubhouse, but I don't know what we can really comment on his role in there. We just don't know. A manager can't be at all places. In terms of analytics, he certainly has the people around him that will encourage it. This is an impossible question to answer with any certainty. Managers usually get too much credit when the team wins, and they get too much of the blame when things go bad. I'd give him a D. We're not at the point where I'm demanding he be fired, but I definitely think the team would be better off with someone else running the show. I'm happy to see the Twins are bunting much less frequently this year, but I'm still depressed at how inefficiently the bullpen has been managed. There's also no shortage of strange lineup decisions. He seems to have no interest in providing opportunities for younger players and caters to the veterans far too often. I have a lot of respect for Paul Molitor. He's certainly knows more about baseball than I do, but expertise doesn't always translate to management. Expectations were high for the Twins heading into the 2018 season and things haven’t exactly gone as planned. Falvey and Levine seemed to have put together some strong pieces to build off of last season’s playoff run. However, no one could have predicted the lack of production from Miguel Sano, Byron Buxton, and Brian Dozier. There’s little a manager can do if the team’s best players aren’t performing or aren’t even on the roster. I honestly think the front office will decided to go in a different direction this off-season. I believe Falvey and Levine are going to want to bring in someone younger that fits the mold of “being their guy.” They could give Molitor one more chance to see what he does with the club next year but Minnesota won’t have the likes of Sano and Buxton around forever. If the time isn’t now, when will it be? Overall grade, C- but he moves to a C+ with extra credit for AL Manager of the Year. Molitor was put in a difficult position, but he also hasn’t done himself any favors. This front office likely would’ve hired their own guy had they not been mandated to do otherwise. He saved his skin by winning Manager of the Year in 2017, but he’s continued many of his poor habits this season. Bullpen usage has been questionable, in-game strategy leaves something to be desired, and lineup configuration has been head-scratching at times. Nothing he’s done has been egregious, but the sum of all parts seems average at best. It’s hard to gauge his relatability to this roster without being in the clubhouse, but I tend to believe there’re better options in that department. On a grading scale, I’d tag him with a C-. Regardless of his three-year deal, which did seem odd, I don’t know that Falvey and Levine won’t move on this winter anyways. I'll begin this one by pointing out the cliche that managers get too much of the credit for winning and too much of the blame for losing. The players hit, pitch, and play defense while managers really can only make personnel decisions and have situational influence. But that is where good managers can make their mark. As far as personnel decisions go, Molitor doesn’t get a passing grade from me. Overuse of bullpen pitchers has quite clearly affected their performance. Platoon advantages have not been utilized enough. At times I've thought it was like he's spinning a roulette wheel with players names on it to figure out the lineup order he'd throw out. The up and down records of his his teams during his tenure also tells me he may not have that special sauce that extracts the best out of most of his players consistently. That's one idea I do think the great managers accomplish. When it comes to the situational side during a game, outside of his use of the bullpen, I do think Molitor does well. He's embraced shifting on defense, I don't think they've done much bunting, and based on his Hall Of Fame playing career I know he’s seen it all. I trust him to make the correct decisions in that sense. Overall, I’d rank him around the middle of MLB managers, but his time is running out. This is really a tough question. Obviously, you can’t say Paul Molitor has been an incredibly good manager at this point, based on the results on the field, even though last season’s second half was certainly encouraging. But I’m not really sure you can lay the lack of success this season purely at his feet, either. While most of us were looking for a strong year as they prepared for spring training, I think if you’d have told us then that Polanco and Santana would each miss the entire first half of the season and Sano and Buxton would spend so little time on the active roster, our expectations might have been more muted. I’m not sure you can blame the manager for not winning more games when those major pieces were absent. Personally, I’d probably give him an overall grade of C+ and, based on that, I won’t really have any objection whether the front office decides to keep him around or bring in someone new. Rosario, Berrios, Escobar, Gibson, Kepler(vs. LHP), etc.Was Molitor an important part of those guys making some improvements?Did he have conversations that allowed some sort epiphany for these guys? Does he get credit for helping make Adrianza, Cave, serviceable fill-ins this year w/ potential of being quality bench options in future? Its impossible to quantify, but for me needs to be part of the equation for Falvine. Bullpen over use (of specific players) is a huge issue......as is continuing to play Grossman over Austin, and other examples of more experienced players clearly getting preference, even in a lost season. I don't blame him at all for the players that were just flat out bad this year, that is largely out of his control.....but the two above things are not acceptable. Given some of the comments about the clubhouse by some of the players, I'm not sure how well the clubhouse was managed this year. But, we'll never really know. These are fair assessments in my view. I don't really think that he's the worst manager in the game, but he's clearly not the best. I think I'd grade him out in the C- range myself. Bullpen usage has always been an issue. Some of his lineups are odd at times, but that's not as big of a deal as other things. He caters to the veteran more than I'd like, which is a massive problem on a team that was young and up-and-coming when he was hired. He still exhibits this mentality now. While they have improved a bit over the course of the year, I still think that this team lacks sound fundamentals. I don't think he gets everything out of his players that he can. Baserunning and situational play, hallmarks of Molitor's playing career, are lacking on this team. If he can't instill his own strengths as a player into his team, that's a problem. I do think that he knows the game and knows it extremely well. I just don't think he's able to translate that into what it takes to be a good manager. He may be a very good coach in another situation, but I've never felt that he's been the right fit for this team. This is an excellent point.Given that the Twins get an F for player development, its a good question to ask what role each member of the Twins' organization has played in the "total system failure". I agree on the bullpen use, could be better. As a big fan of small ball, I don't blame Molly for bunting at all.. actually I look more at the players themselves. It's a lost art that falls on the development of players over the last few years that you just haven't seen stressed enough in the junior, High School, and College levels as much as it once was. But, overall, I really find myself being rather 'meh' about Molitor. Loved him as a player, and I personally think he isn't a bad coach... just not a good manager. Might I ask who would be preferred as a replacement? Developing younger players (more so in losing years obviously, but this is a part of the job). Most importantly, always put your team in the best shot to succeed. Not just on a nightly basis, but for 162 games. The last one is the most important, and also the hardest to do. I don't know if they'll ever come up with a WAR stat for managers, but I would have a tough time believing that a good manager doesn't add a few wins over the course of the season by making consistently good choices with line ups, substitutions, the occasional SB/bunt/pitch out/hit and run decisions, and the bull pen. You won't see a number on it because it's hard to quantify what might have happened had a decision been made differently, but being unable to understand how to quantify that doesn't make the conversation irrelevant, and I think trying to boil down a complex decision tree to luck and/or overrated is a big mistake. In a lost season, much of this can be put on hold in favor of playing experience, but when you're contending, this has to be front and center.I didn't like Gardy because he setup his team to fail way too often, and they were usually contenders. Molly has done plenty of that too, and it's even more annoying given that contention ended a long time ago, and he still chose to overuse a few key arms, which sets us up for potential injuries and problems that could potentially be in play come 2019. I really don't care as much about his lineups today versus say April/May timeframe, but come next spring, that's pretty important again. His pen use, right now, really bothers me. He should be resting guys like Hildy in favor of letting some of the kids learn how to get batters out in higher leverage situations. This is a strange point. Robbie Grossman has started one game since Tyler Austin has been up. That was last night -- against a righty, which Austin has struggled against. I don't care that Austin has struggled against righties, Grossman is not part of the future, Austin might be. Still, it's only one game. The pattern with Molitor is that he *almost* gets it, but never quite completely. The mistakes he makes are pretty stupid mistakes. A good comparison is Mike Tice, only worse. Mike Tice made every mistake one could possibly make, but unlike Molitor, Tice made his mistakes once. Molitor doesn't see his mistakes and keeps on doing them. 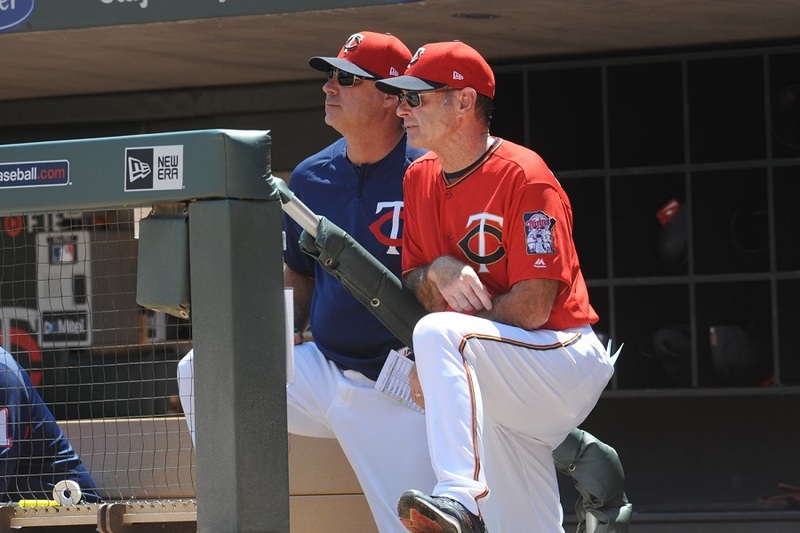 Molitor might be the Terry Ryan of managers. He succeeds on the small things, doing just well enough to keep his job and keep people thinking about "What if we just give him one more chance...."
I give him an F because as long as Molitor is filling out lineup cards, mentoring players, and managing pitching, the Twins are missing out on having a manager who can do all these things properly. In real life, you either pass or you fail, no one hands out Cs and Ds when you don't get the job done and don't learn from your mistakes. Another reason its hard to answer is we don't know the alternatives.Falvine should know who would be on their shortlist, so that becomes another measuring stick for Molitor. Personally, I just want fresh...the proverbial turning of the page, blank slate, etc.This off-season with cap space, prospects, etc. it seems we are going to see the next 'wave' come in and I want a new manager in place to grow with them and create a new Twins identity. With all that said, I am not in the camp that would say anyone is upgrade to Molitor which is why Falvine needs to weigh him vs. who's on their shortlist.I won't revolt if Molitor still in place, he has shown some ability to adapt(i.e. shifts, bunting, moving Dozier out of leadoff) and perhaps bullpen usage is his next adaptation. Mike Tice didn't get his draft pick turned in on time, twice. Lots of thing to like and admire about Molitor, IMO. To me, a manager's value is primarily in two places:the demeanor/attitude of the team; and in-game decision-making (which includes lineups).The former is hard to assess and very dependent upon what information makes it's way to the assessor.My guess is he might be pretty decent in this arena...but not inclined to defend that...I'll not go there for now.The later is easier to assess/observe. I don't think Molitor is a good (say even top half of the league) in-game manager.I think he's gotten better. Do I think there are better over-all options out there?Yes. Austin has an .833 OPS against RH starting pitching, which is better than his hitting against LH starters. He struggles against RH relievers, probably because RH relievers tend to throw harder. I note a couple of people in the round table seemed to imply that Molitor’s fate rests in the hands of Thad Levine and/or Derek Falvey. Jim Pohlad may be one of the most “hands off” owners in pro sports, but I think you are kidding yourselves if you believe he doesn’t ultimately decide who the manager is and when or if that individual is fired. I like Tom Prince. IMO he gets a MLB job offer somewhere this offseason. He spent 11 years managing in the minors and the last two years as bench coach at the MLB level. I don’t know how much longer Hurdle plans to stay a manager, but Prince isn’t that much younger. Perhaps he will need to leave his comfort zone (Pirate organization) to get a shot. Of the six responses in the article itself, I think it's telling that none go out of their way to praise a single thing about him. "Managers get too much credit/blame" is about the best anyone can come up with as a defense. That, in and of itself, should tell you Molitor needs to go. "Well, yeah, but how much impact does he really have" is not a defense. It's a rationalization. His pitching decisions are questionable...everyone agrees. The Twins are among the worst fundamental MLB teams you'll ever see...everyone agrees. Questionable baserunning decisions seemingly two or three times a week...everyone agrees. Boneheaded decisions on defense, such as Rosario's weekly throw to the wrong base...everyone agrees. I could go on. All of those come back to, at some level, the manager. We might not see the clubhouse stuff, but we sure see the on-field stuff. Are the Twins trying to be world class, or not? Is Molitor a world class MLB manager, or not? Not one person here has said he's a great manager. Not even said he's a good manager. Sometimes the answers are simple if you just accept them. Owner dictates who manages the team. Veterans dictate where they hit in the lineup. Mauer can choose whether or not he wants to play baseball on a given day. There seems to be a lot of demands for a mediocre, sometimes very bad team. As far as Molitor is concerned, he's okay. Beat writers like Lavelle say he's one of the most insightful people he's interviewed. He is utilizing analytics more than he did when he started managing. Something is not translating to the players, though. Is that fully his responsibility? Is that a partial responsibility between him and the other coaches? As far as his bullpen usage, either he feels he doesn't have the talent (I'd argue that's been the case) or he has trust issues with players. On a daily basis, he's not going to satisfy all fans with his lineup card. On a game thread I may poke fun or say 'WTF, Motter in RF?' I'm sure every manager in baseball has strange lineups like that if we studied everyone's card like we do for the Twins. Overall: C and he stays next year. What has Molitor done at an average to above average rate? I can think of nothing; therefore I give him an F.
Why are we keeping someone with a C grade? Are we aiming for .500? Is that the goal?